There is a definite reason why I prefer writing to talking 9 times out of 10, and that is the presence of thinking. In my experience few people allow themselves or others time to truly think during oral conversations. For example, I respect my grandfather very much, but if you pause before answering one of his many questions he jumps to the conclusion that you are going to either lie or hold something back. In order to have a thoughtful conversation, the people involved must allow for it to take time. These days many seem to value speed over quality. We want the fastest Internet, the speediest cars, and instant gratification for our work. It’s as if we were all in some big never ending race. Maybe this is because we feel that the faster we get results the longer our lives will seem, since there will be a larger number of things we can get done. However, what is the worth of the things we are accomplishing with speed? I do think it’s very possible for speed and quality to coexist, but not often when it comes to developing new ideas. I have fun conversations about nothing of importance all the time with my friends, but the truly great conversations are the ones that make me formulate new ideas. These are the times when the answer is not on the tip of my tongue, but instead I must think about it from multiple angles. Conversations like these are so great when they happen because they always teach me something that I didn’t know about myself, the subject matter, or often both. When my mind is truly working during a conversation (or while I am writing), I start to smile without even being aware of it sometimes. A natural happiness is created within me because my thoughts are flowing with those of the person I am talking to. I suddenly have more ideas pulsing through me than words to express them and this is an extremely exciting feeling. When I am writing something thoughtful I try to develop questions in my head that someone might ask me about my subject matter. Even if I’m writing about memories I push myself to add details that make me think in depth about each experience I am hoping to convey. In truth, oral conversation is what I would prefer if people were really willing to take time to have one. It is only because few people are willing to take this time, that I prefer writing. Blogs like this one allow for an open conversational format which gives the writer the benefit of feedback. Being able to actively participate in a conversation with countless others, on any topic you could possibly imagine, is a priceless gift. It also presents the benefit of anonymity, allowing people to feel confort in saying what they really think. 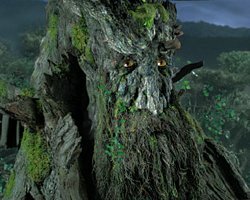 I admire the character of Treebeard because he points out that if something is worth doing or saying, it should not matter that it takes time. I would rather say or do less and have it mean something, then rush to do everything and have it all mean nothing.